What were you doing when Greece won the European Cup? Alex was falling in love, with a Lebanese Muslim! Alex and Eve is about Alex, a single 35 year-old, who feels he has “missed the boat” and is now pitifully destined to be alone the rest of his life. Alex is balding rapidly and believes no woman would want to marry a 35 year-old bald high school teacher who lives at home. Inflaming his angst and insecurities are his Parents who continually pressure him to marry as soon as possible – and she better be a good Greek- Orthodox girl! During the Euro 2004 Soccer Championship Tournament when Greece’s fortunes take a miraculous and mythical turn for the better Alex meets Eve, an attractive corporate type. Despite the insecurities of both, sparks fly, but, before getting ahead of herself, Eve reveals to Alex that she is Lebanese- Muslim. Alex confidently reassures her, and everyone around him, that he doesn’t have a problem with her religious background. But does he? In a reversal of roles Alex becomes the student seeking advice from his high-school students. His best friend Paul, a native Irish-Catholic, doesn’t help matters when he elaborates on the consequences of cross-religion marriages in Ireland. To complicate matters, Eve’s Parents have reached breaking point with 30 year-old Eve and thus step up the pressure on Eve to marry – and he better be a good Lebanese-Muslim man!At a time when Greek pride and patriotism rises with every Greece soccer victory, Alex and Eve must decide on what will win out? The power of national pride, patriotism, religion and cultural tradition? Or the power of love? …there is an unpretentious air of truth to it and Australian theatre needs more plays like this. A play that explores Australian multicultural issues is bound to draw the crowds and this production will leave you grinning from ear to ear. 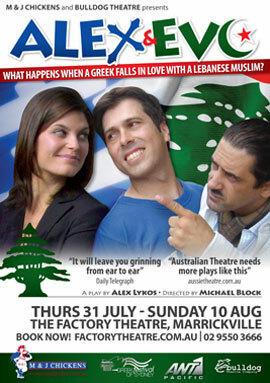 Or to translate, that when we bring out 3 gray boxes you see a typical Greek home in Marrickville! With this logistic problem solved rehearsals began and on the 12th of July Alex and Eve had it’s premiere. With the continued success of the show it might be surprising to learn that in that opening weekend the audiences were pretty small and in facet one show was cancelled due to low audience numbers. As soon as word got out though the phones started ringing and tickets started to sell like hotcakes. Alex and Eve has since gone on to have a further two extremely successful seasons with the ‘sold out’ sign getting worn out, and recently toured to Adelaide bringing the Bulldog Theatre Company national for the first time. Late in 2009 it was announced that Alex and Eve would become a major motion picture with a tentative release date in 2015. The original run took place at the Sidetrack Shed Theatre in Marrickville and ran for two weeks with shows on Wednesday – Sunday.